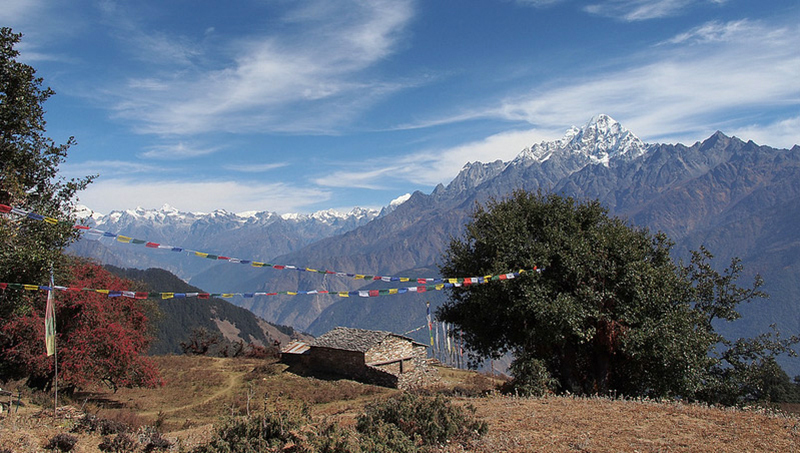 I have visited Nepal before attracted by the beauty of the mountains, the warmth of the people and the chaos of the capital. 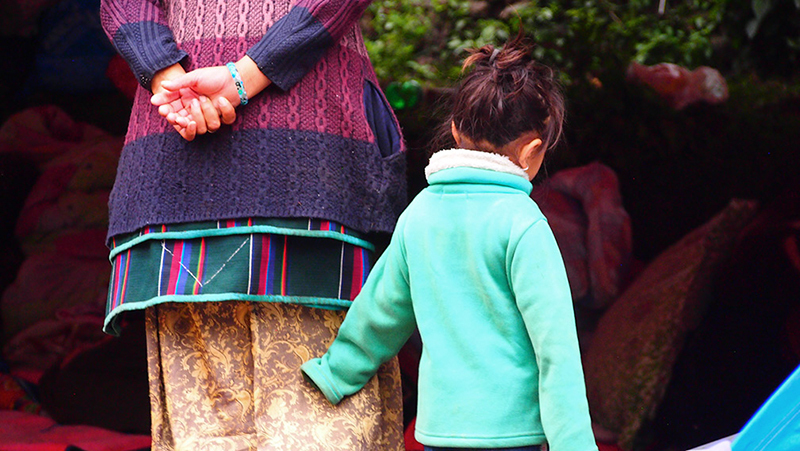 Although this would be my third trip to the land where both Buddha and the pagoda were born. Although I have seen tigers, rhino’s and elephants in the wild here, I have never seen a Monal pheasant. 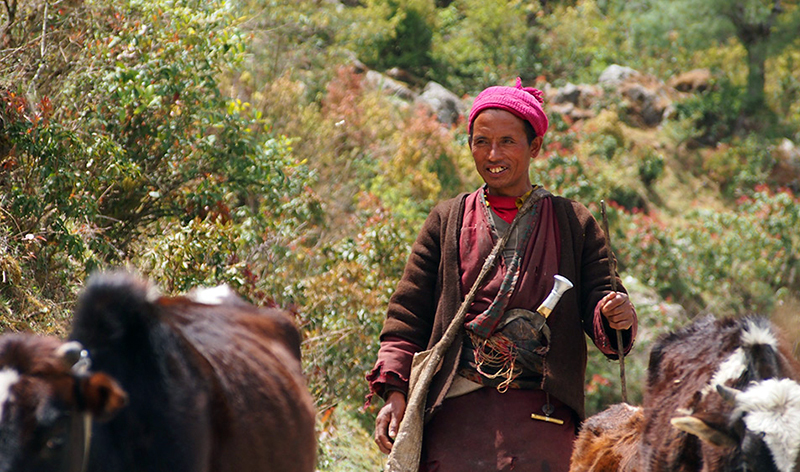 The Danphe (as it is known in Nepal) lives at high altitude from 2000 to 4000m. 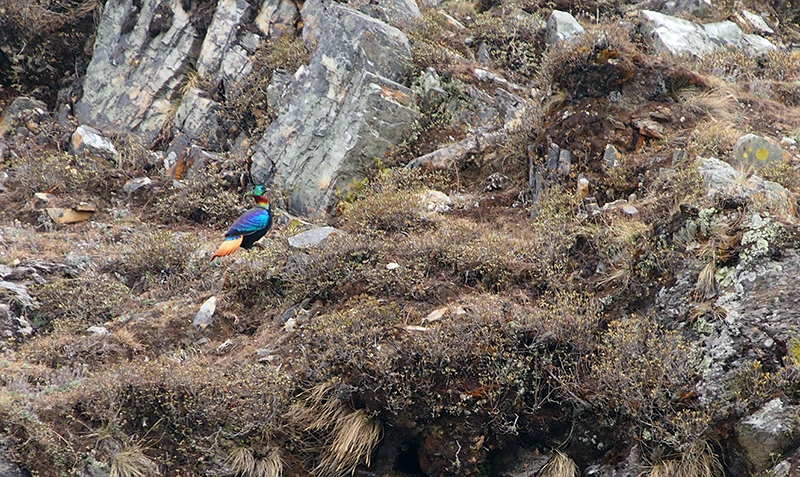 I was very lucky last Saturday while climbing up the pass to Nagthali in the Langtang region of the Himalayas to get a sighting of this wonderful national bird. Moments later the mountainside and indeed the entire country was rocked by a massive earthquake measuring 7.9 on the Richter scale. 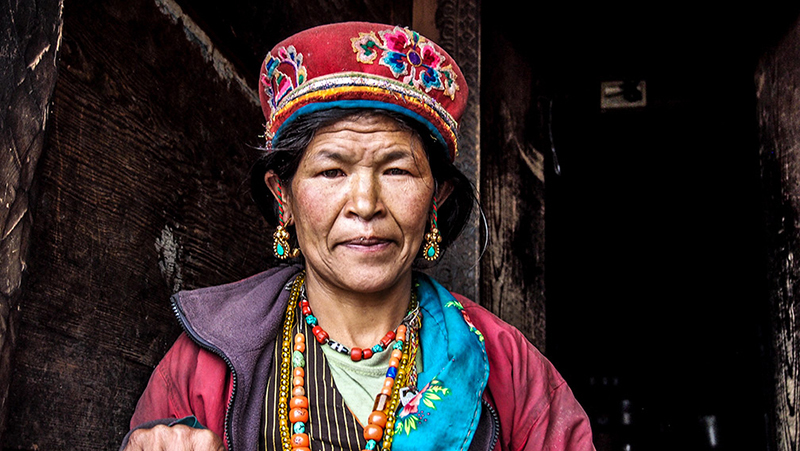 Very much attracted by the culture of the Tamang people of the area (they have a very distict culture, language and religion) I headed out with a couple of good Nepali friends. 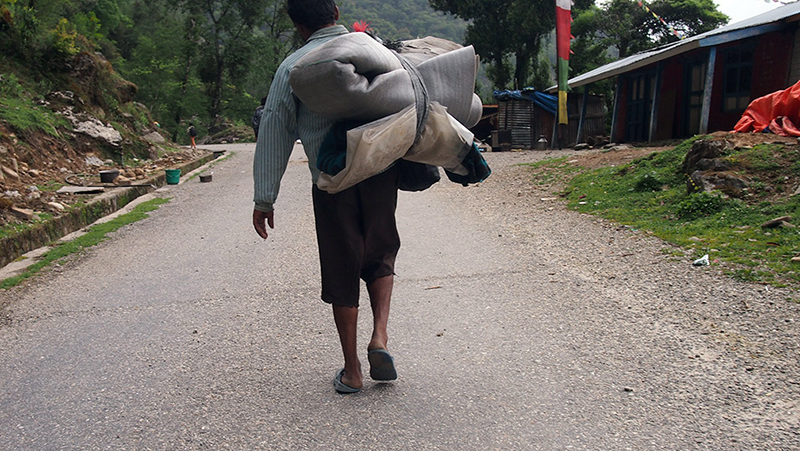 No guides or porters, we hit the road hard. 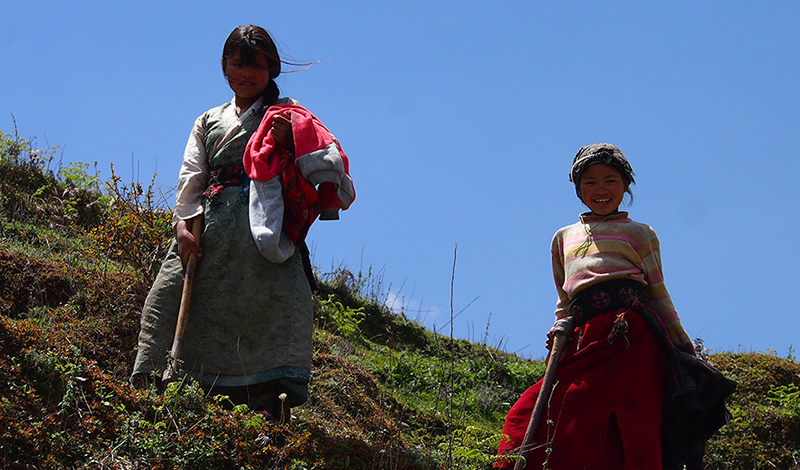 Starting at the town of SaphruBesi we headed up the steep windy path to wards Ghatlang.The first stop on the Tamang Heritage trail. 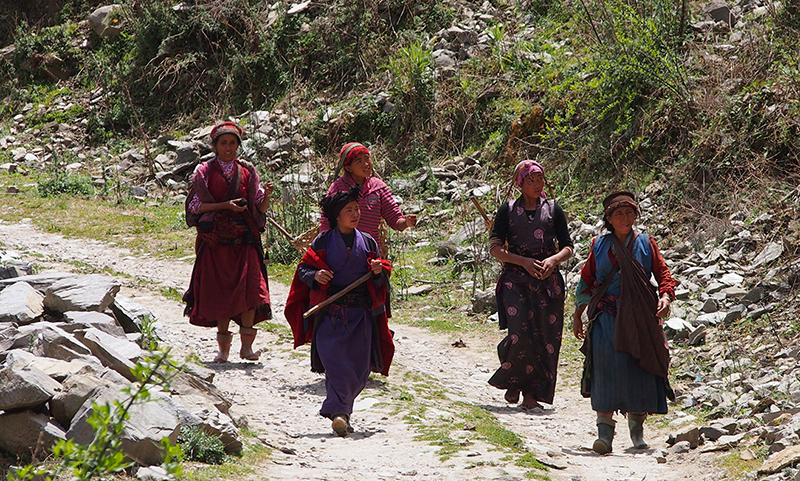 We met many interesting characters on the road including this group of Tamang women. 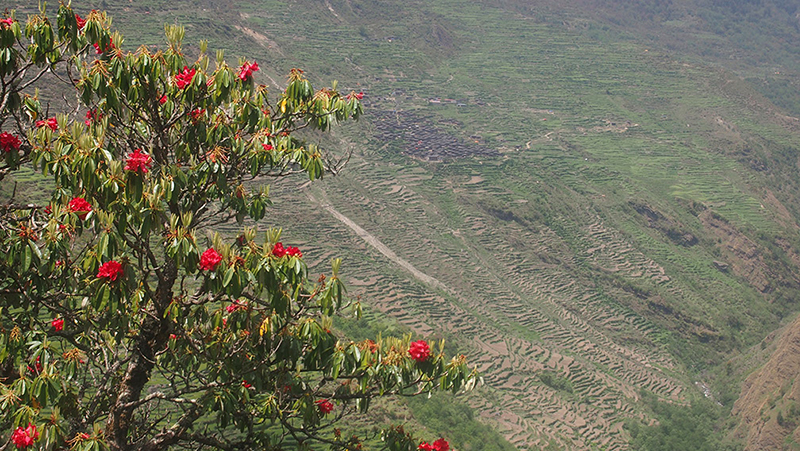 Most Tamang villages sit on the steep terrace hillsides. 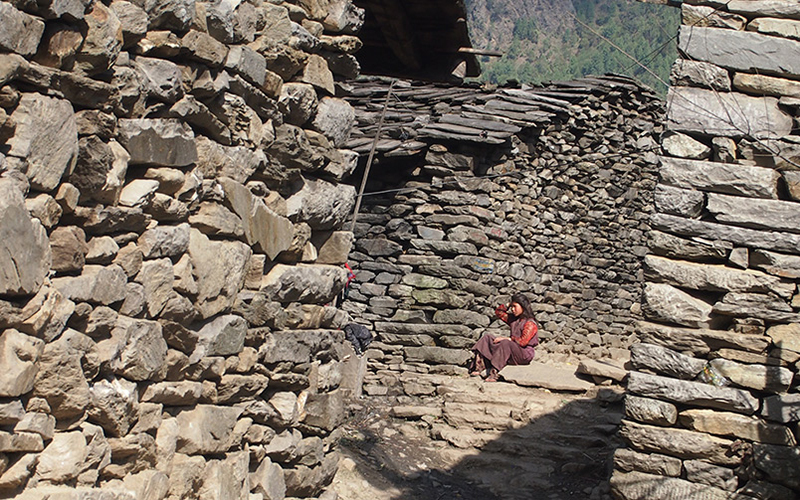 Most Tamang villages are compactly built with narrow alleyways paved with stones. 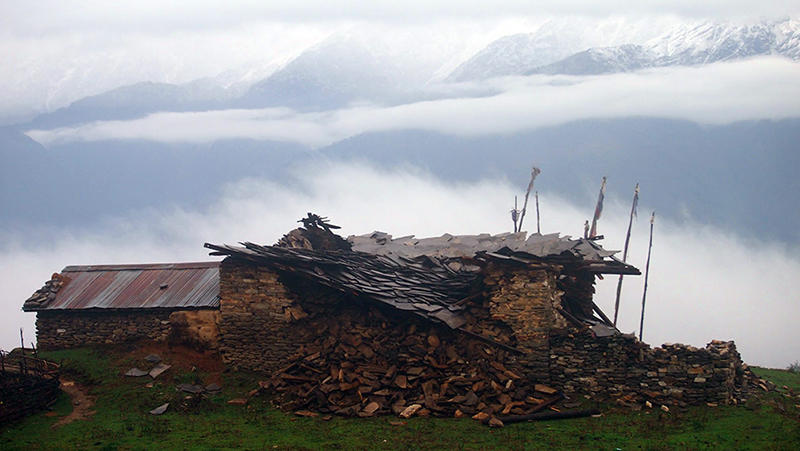 The houses are built of stone walls and slate or wooden shingle roofs. 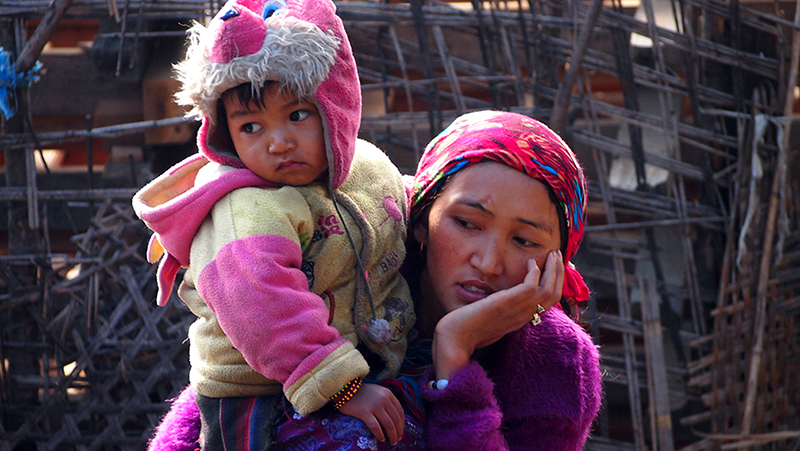 Most men are away in other regions or countries for work leaving the village filled with women and kids. 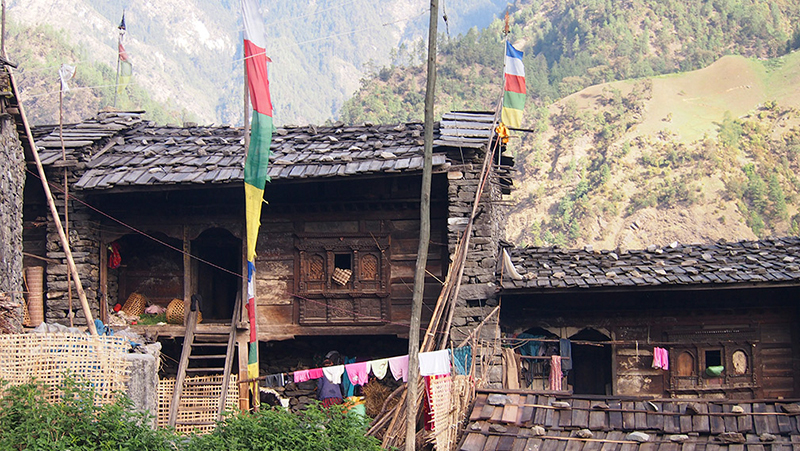 After spending a lovely day and night here in a home we decided to keep trekking up towards Nagthali. Passing through some beautiful landscape. 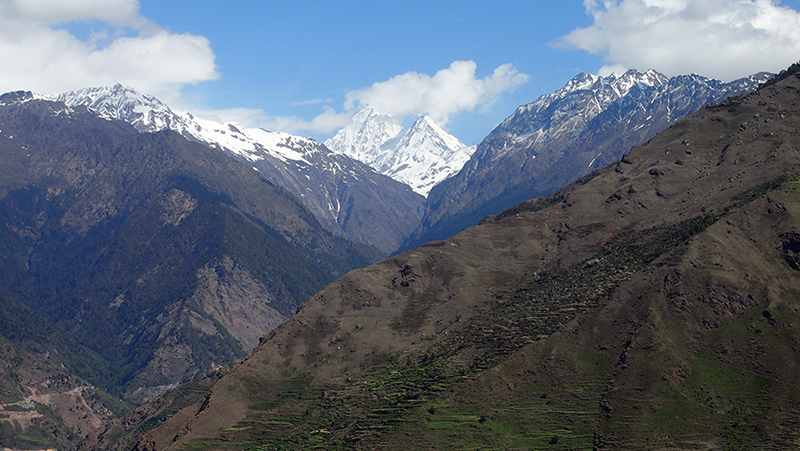 We reached Nagthali around noon on Saturday and sat down to drink a cup of tea and enjoy the views. 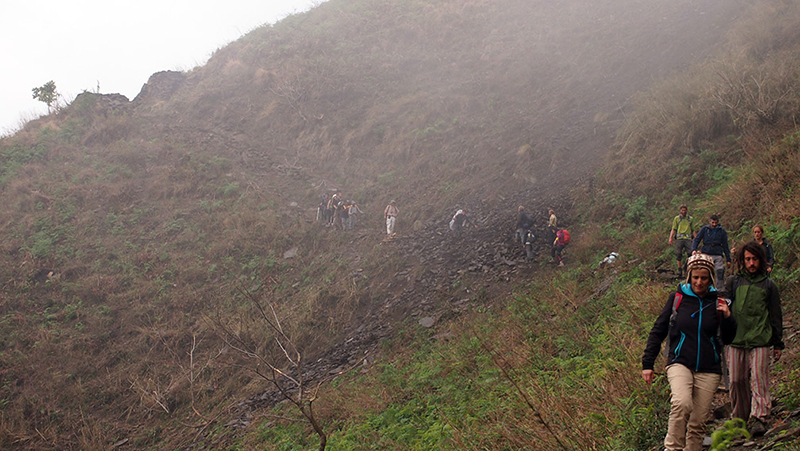 A couple of minutes later the ground began to shake fiercely beneath us rocking the mountain for a few minutes. 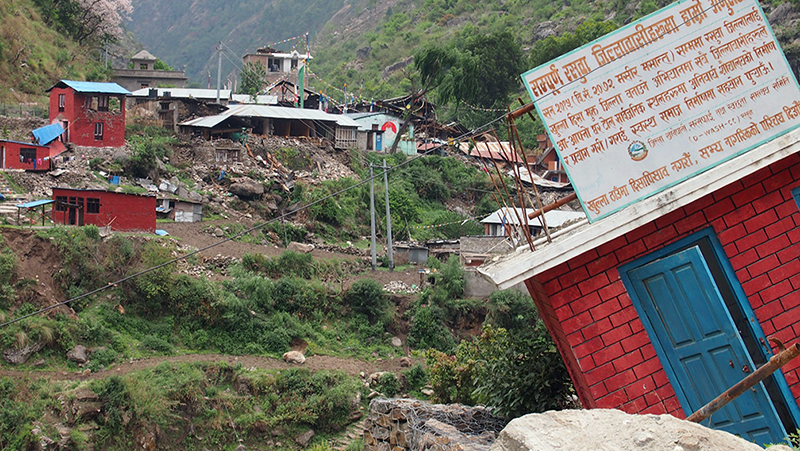 Moments later a second quake began shaking the buildings around us, this one collapsed. Very quickly the sky darkened and a blanket of dense fog and rain had us trapped on the mountain so we took shelter in the lowest building we could find for the night. 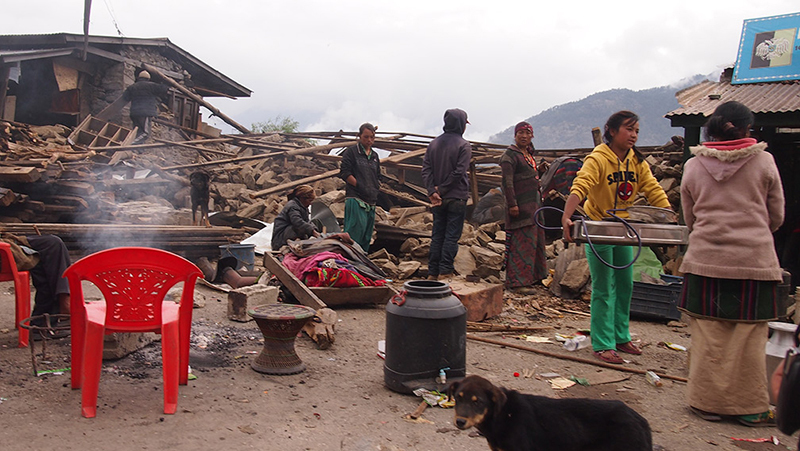 We sat around the fire and listend to the radio, this is where we heard that it was not only this isolated mountain that was rocked by the earthquake but the entire country and was fast developing into the largest national tragedy in almost a century. 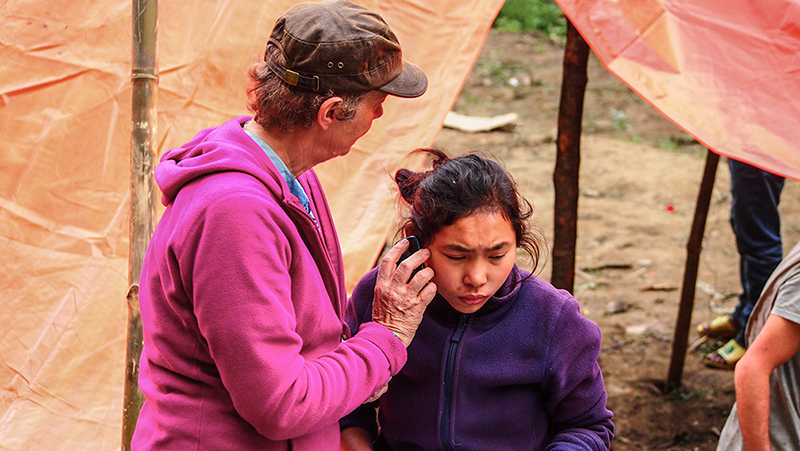 As the nationwide death toll crept into the thousands the rumbling of aftershocks kept coming well into the night and early morning, having no network reception on our phones added to our feeling of isolation and fear. 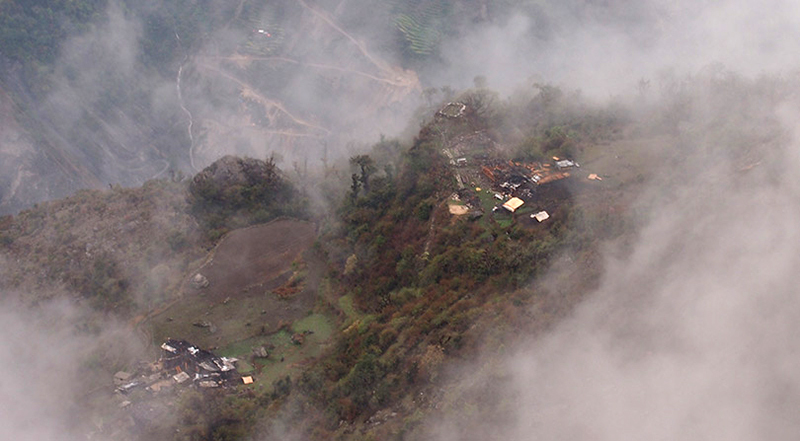 The next morning there was a short break in the fog and we decided to set off down hill to reach a larger town where we could have access to a phone network and be able to reach the emergency rescue services. 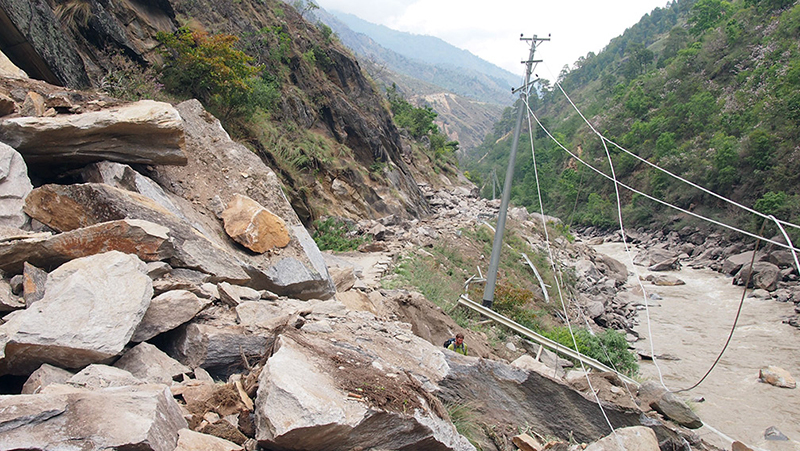 We had heard from some locals that the village of Thumaan which we were heading towards had been flattened and the path was not clear due to landslides. 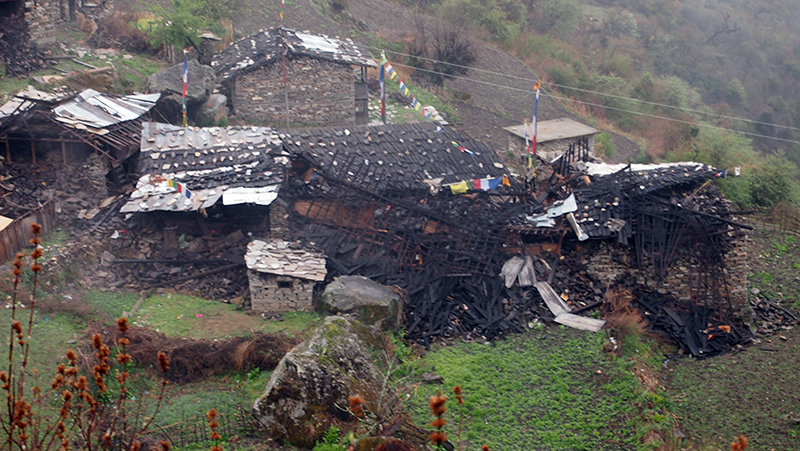 On our climb down we either saw from a distance or walked through village after village completely destroyed. 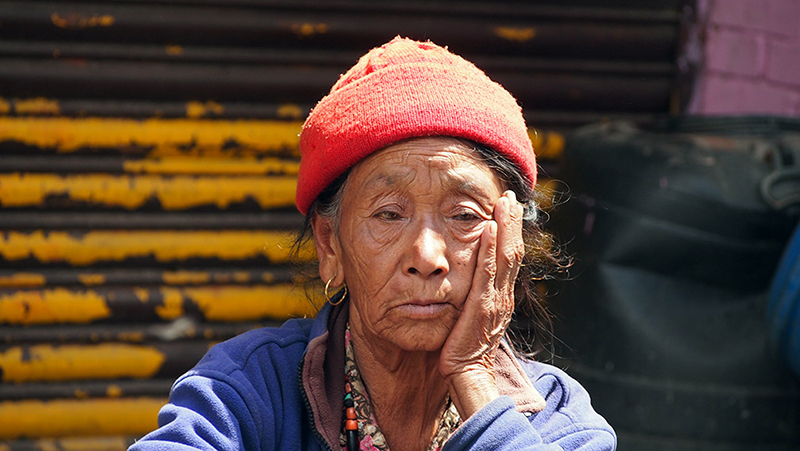 I had chatted with this elderly Tamang woman on our way up the mountain the day before as she sat in front of her home. 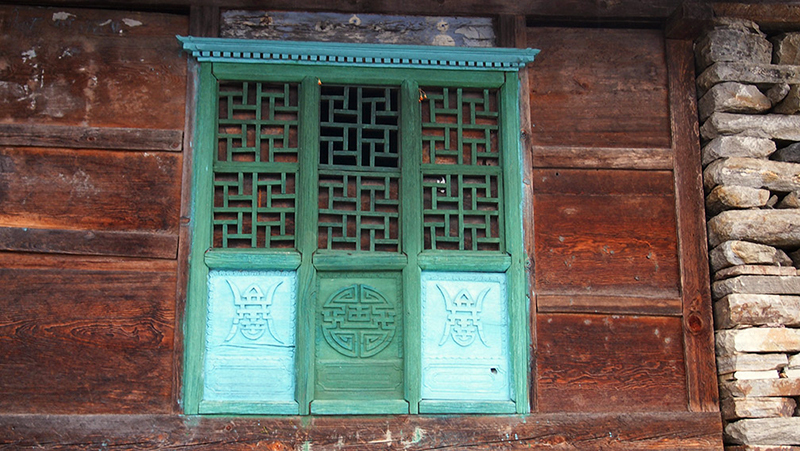 Her house, like most Tamang houses had beautiful decorative detail on the outside. I was devastated to now walk by the same house and see it like this I can only hope that she survived. 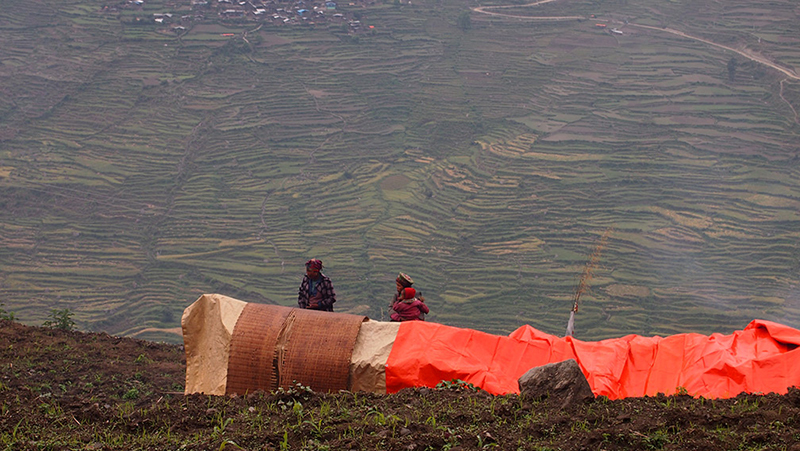 Carrying on along the mountain trail we saw people had moved into makeshift tents. 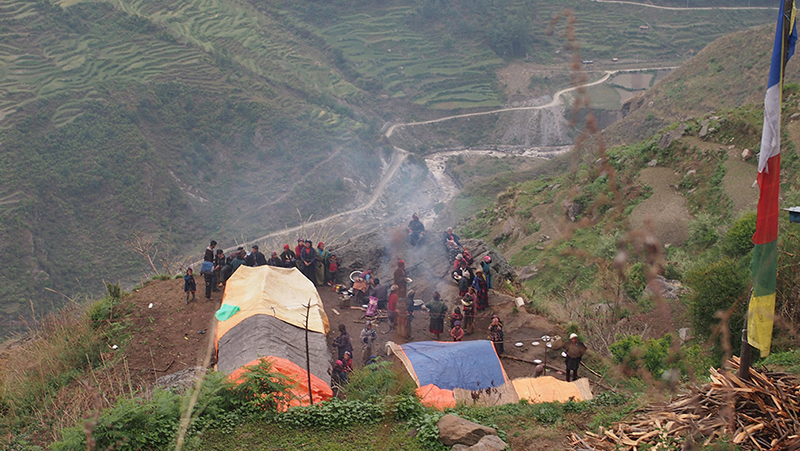 Villagers had also set up tents for the injured. 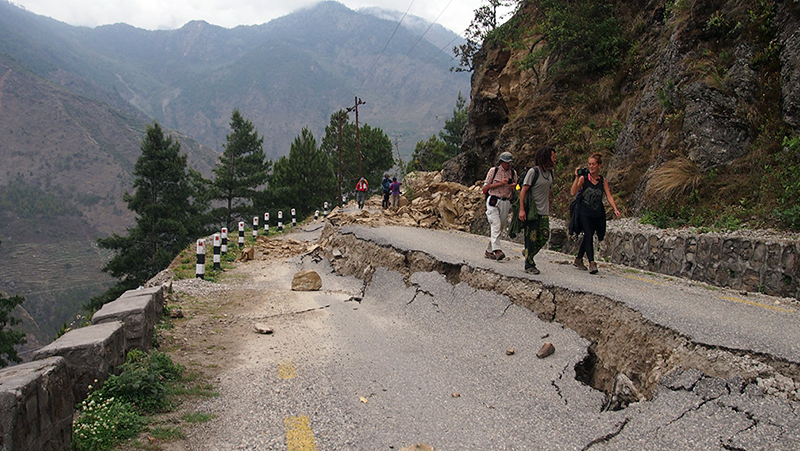 We came off the mountain and hit the main road back to SaphruBesi, nervous of the continual huge landslides. 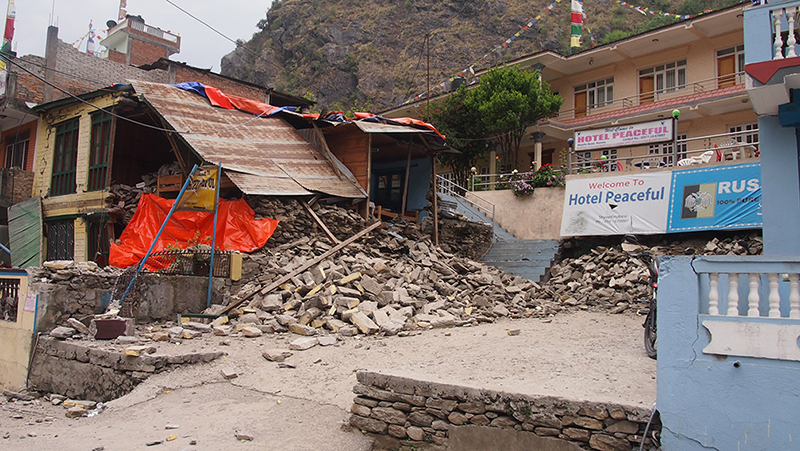 The Turquoise building in this picture was a bakery where we ate a few days earlier and spoke to the owner.He had told us that his previous home was destroyed in a landslide a few years ago. He rebuilt it next to his bakery and now we see that it isflattened once more. I hope he survived. All the hotels and shops are on the main strip in SahruBesi, most of them now destroyed. 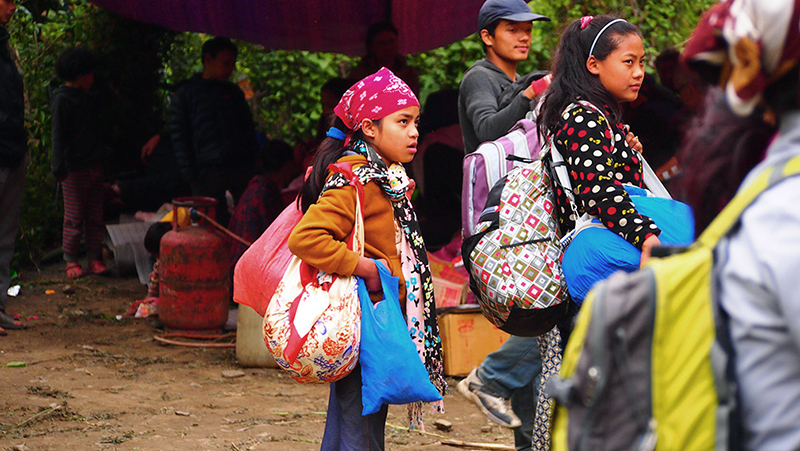 We made our way to the emergency relief camp to rest and get food and water. 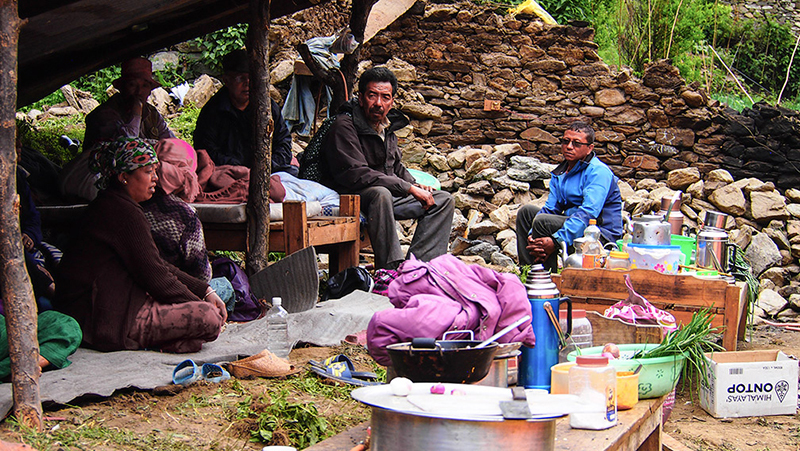 The roads in and out of town were blocked from landslides; unsure of what to do we spent the night at the camp. 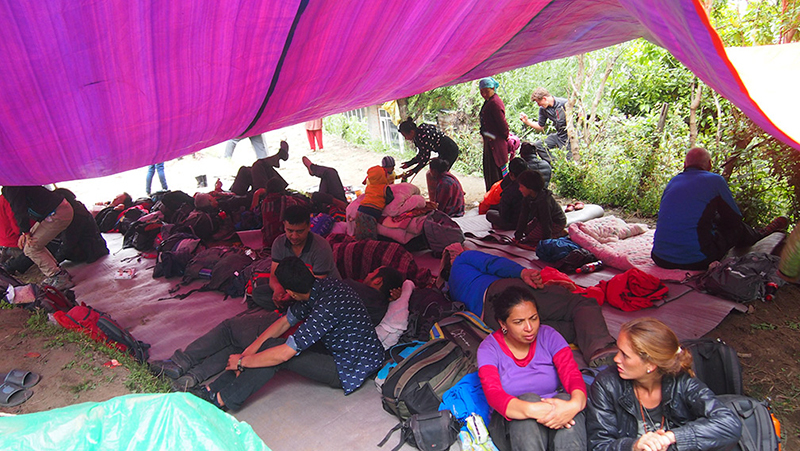 The next morning we decided to walk 50 km to a town beyond the landslides rather than wait for days at the relief camp for a possible airlift. With so many people at camp it seemed like waiting on a hope. 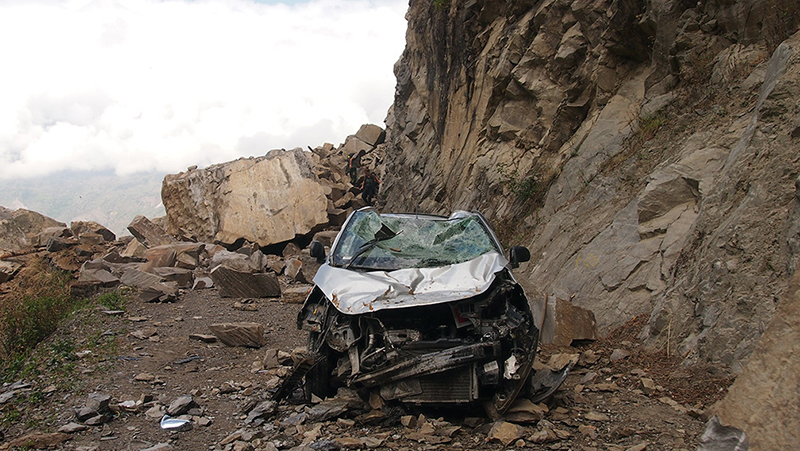 The road was quite perilous, deserted of people but many abandoned or crushed vehicles. 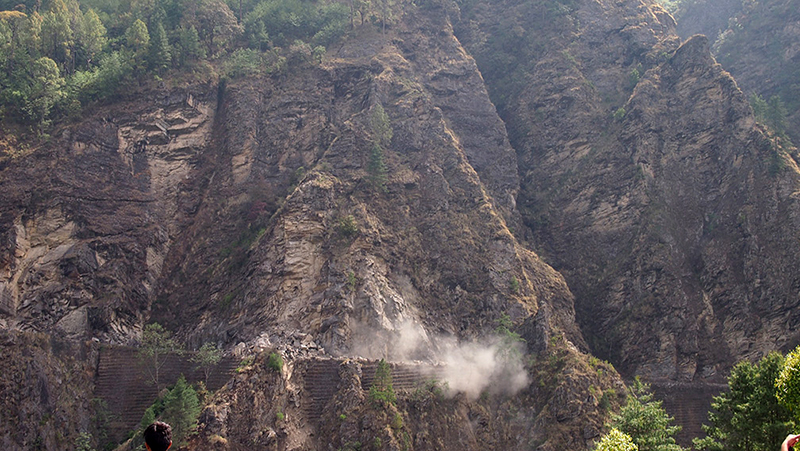 We saw a huge amount of landslides between Dunce and Kalikastan. One landslide just missed us by less than five minutes. 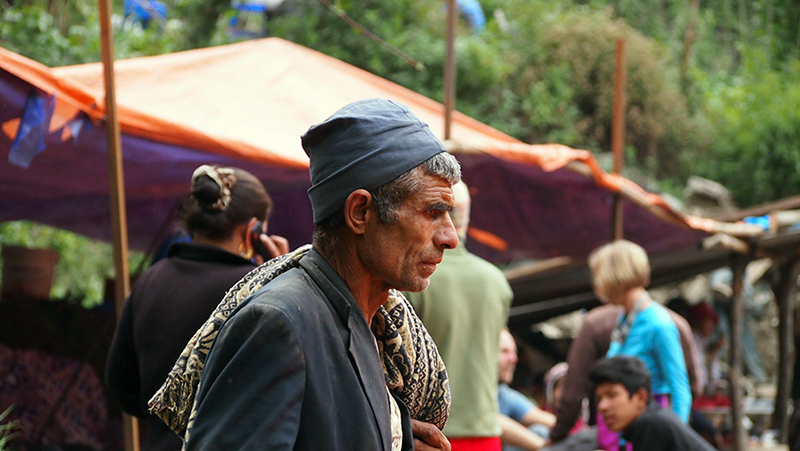 A lot of people are sticking around and are eager to rebuild their lives. Some need time to overcome their despair. 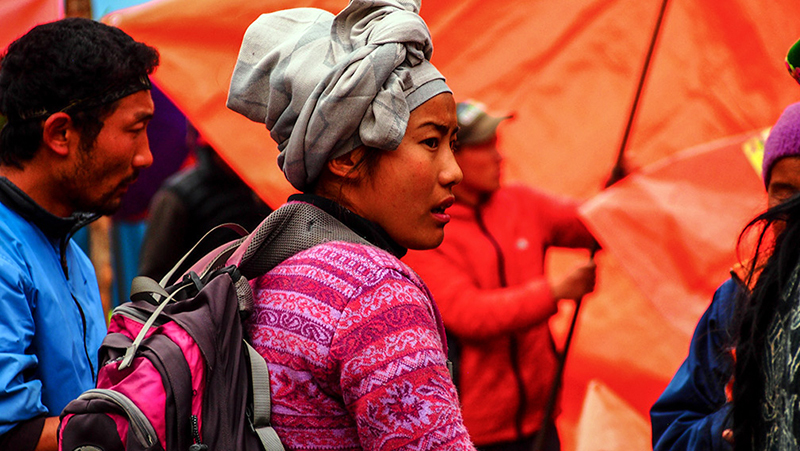 This photo story is dedicated to all the wonderful characters that I met on Tamang Heritage trail, all those who lost homes, villages and loved ones and to all the people of Nepal. 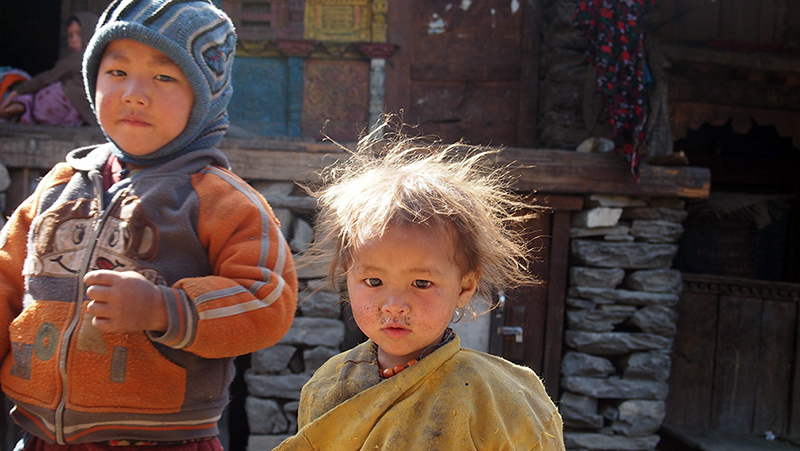 I have read this beautiful adventurous article. 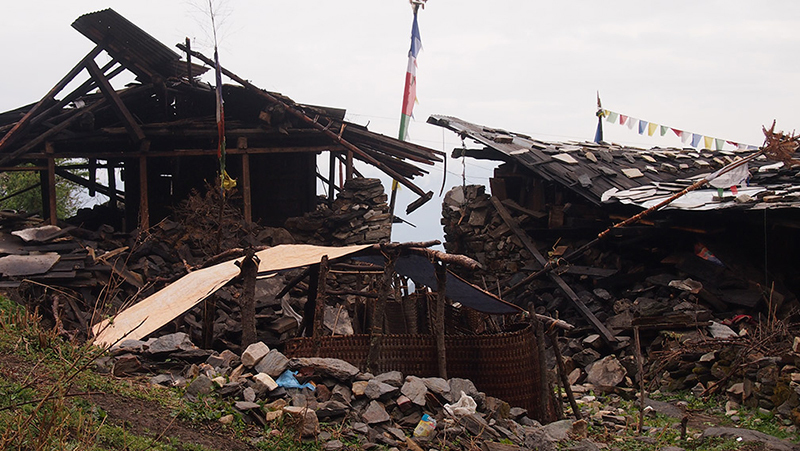 Thanks so much Martin Travers, for your detail about devastating earth quake from the Langtang epicenter(Nagthali).I visited Rasuwa to Gosainkunda(A Hindu religious area.20 years ago. 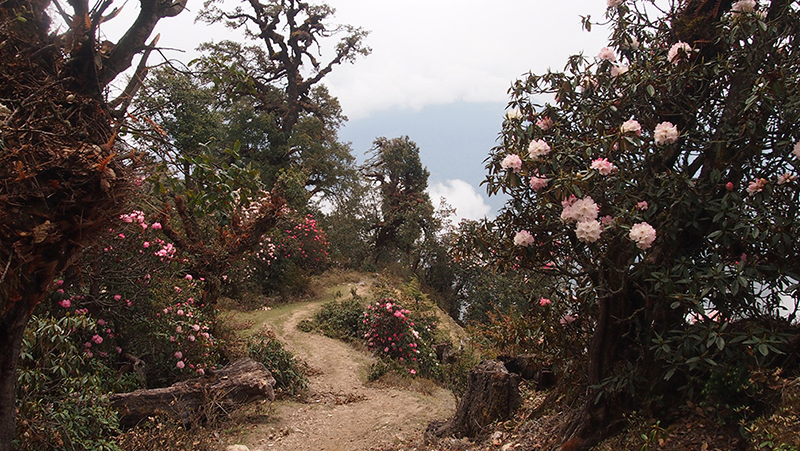 Then i never gone there, cause of very remote and shock of high altitude. But i am changing my feelings about hilly region and want to go again after reading your beautiful details of our hilly region and life style.